In Physics work refers to any activity that produce motion. Work is done only when the resultant force and displacement are not zero. The amount of work done by a particular force largely depends on the two factors that are magnitude of the force applied and displacement of the body. We can say that work done in moving a body is equal to the product of force exerted on the body and the displacement moved by the body in the direction of force. The S.I. unit of work is joule. If a force of 1 Newton moves a body through a displacement of 1 m in its own direction then the work done is known as 1 joule. Work is a scalar quantity. Thus, the work done by the force is negative. A man lifts a luggage of 10 kg from the ground and puts it on his head 1.5 m above the ground. Calculate the work done by him on the luggage. Energy is the capacity or ability to do work. Without energy life is impossible. The demand of energy has been increasing very rapidly day by day. The sun is the biggest natural source of energy for us. The amount of energy possessed by a body is equal to the amount of work a body can do when its energy is released. Energy has magnitude only. Therefore, it is a scalar quantity. The S.I. unit of energy is joule, which is denoted by the letter J. The energy required to do 1 J of work is called 1 J energy. There are different forms of energy. The two main forms of energy are kinetic energy and potential energy. The unit of measurement of kinetic energy is Joules (J). An object of mass 30 kg is moving with a uniform velocity of . What is the kinetic energy possessed by the object? The kinetic energy of the object is . Since work done on the object is equal to mgh, an energy equal to mgh unit is gained by the object. This is the potential energy ( ) of the object. Find the energy possessed by an object of mass 20 kg when it is at a height of 12 m above the ground. Given, . Acceleration due to gravity, . The potential energy is 2352 J. According to the law of conservation of energy, whenever energy changes from one form to another, the total amount of energy remains constant that is, there is no loss or gain of energy. Energy can neither be created nor be destroyed. Although some energy may be wasted during conversion but the total energy of the system remains the same consider a simple example. Let an object of mass, m be made to fall freely from a height, h. At the start, the potential energy is mgh and kinetic energy is zero because its velocity is zero. The total energy of the object is thus mgh. As it falls, its potential energy will change into kinetic energy. If v is the velocity of the object at a given time, the kinetic energy would be . 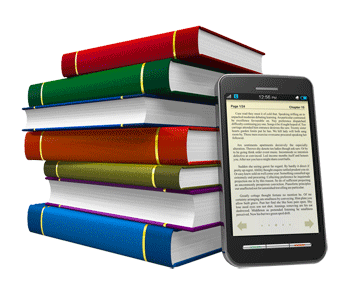 The sum of kinetic energy and potential energy of an object is its total mechanical energy. We find that during the free fall of the object, the decrease in potential energy, at any point in its path, appears as an equal amount of increase in kinetic energy. There is thus a continual transformation of gravitational potential energy into kinetic energy. Power is the rate of work done. Power is a scalar quantity as it has magnitude only. The S.I. unit of power is watt (W). Sound is a form of energy which enables us to hear. We hear different types of sounds around us in our daily life. Some sounds are pleasant and some are unpleasant to our ear. Sound travels in the form of waves. The disturbance caused in a medium that carries energy from one point to another without direct contact between the two points is called wave. Sound travels in longitudinal waves. Sound waves are also called mechanical waves as they require medium to travel. When a vibrating object moves back and forth rapidly, sound is produced. To vibrate it- object to produce sound, energy is provided by some outside source such as our hand, wind or any other thing. The sound of our voice is produced by the vibrations of our two vocal cords that are found in our throat. In general, the objects vibrate very fast to produce sound, which is not visible by our eyes. 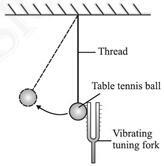 Even in the science laboratory experiments sounds are produced by vibrating tuning forks. v The vibrating strings of sitar. v The vibrating air in flute. v The vibrating membrane in drum. v The vibrating plates in a bicycle's bell. The particles of the medium do not move forward, but the sound wave moves forward because of the vibration of particles that also set the neighbouring particles in vibration. This process is called the propagation of sound in a medium that is visualized as wave. Characterization of sound waves in a medium by the vibration of particles is called mechanical waves. The most common medium for the travelling of sound is air. While travelling the two regions are created in the medium, they are compression and rarefaction. Compression is the region of high pressure and rarefaction is the region of low pressure. The repetition of sound caused by the reflection of sound waves is called an echo. Echo is simply a reflected sound, it can be heard when sound is reflected from a hard surface such as wall or cliff. When we speak something in a close and empty room it produces echo. In hilly areas, you can hear echo because your voice strikes from the hills and returns back to your ear. 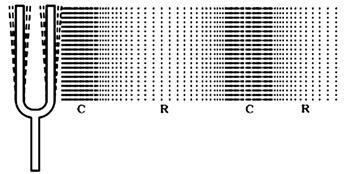 The minimum distance to hear an echo clearly is 17.2 m.
Reverberation is the process of repeated reflection that results in this persistence of sound. Excessive reverberation causes problem in hearing the sound clearly especially in an auditorium and big hall. To reduce reverberation, the roof and walls of the auditorium are generally covered with sound-absorbent materials like compressed fibre board, rough plaster or draperies. The seat materials are also selected on the basis of their sound absorbing properties so that the voice of speaker cannot produce echo. 2. It is also used to clean spiral tubes, odd shaped machines and electronic components. 3. It is used to find the problem in the internal organs of the human body such as liver, gall bladder, pancreas, etc. 4. It is used to monitor the development of baby inside the womb. 5. It is used to break kidney stones into fine grains. 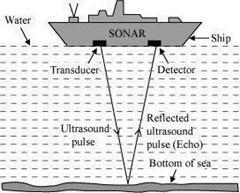 Sonar is an apparatus that is used to find the depth of the sea or to locate the under-water things such as wreckage of ships, shoals of fish and many other things. A sonar apparatus consists of two parts that are: a transmitter for emitting ultra-sonic waves and a receiver for detecting ultrasonic waves. These two parts, help in measuring the depth of things accurately. Frequency, amplitude and speed can describe a sound wave. The number of waves passing a point per second is called the frequency of a wave. Frequency is measured in Hertz . If a wave passes from one medium to another medium its frequency does not change even if both the wave speed and wavelength are decreased or increased. The maximum disturbance from undisturbed position is called amplitude. Please keep in mind that amplitude is not the distance from the maximum point of the wave to the minimum point. The length of a single wave is called the wavelength. The speed of wave is how fast the wave is moving. The time taken by two consecutive compressions or rarefactions to cross a fixed point is called the time period of wave length. 1. Many instruments, such as trumpets, shehanais, megaphones, horns, are all designed to send sound in a particular direction without spreading it in all directions. In these instruments, a tube followed by a conical opening reflects sound successively to guide most of the sound waves from the source in the forward direction towards the audience. 2. Stethoscope is used by the doctor for listening to sounds produced in the heart or lungs. In stethoscopes, the sound of the patient's heartbeat reaches the doctor's ears by multiple reflection of sound. 3. The curve ceilings of concert halls, conference halls and cinema halls are helpful in sending sound in all corners of the hall after reflection. Sometimes a curved soundboard may be placed behind the stage so that the sound, after reflecting from the sound board, spreads evenly across the width of the hall. 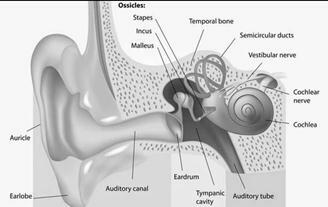 Ear is an extremely sensitive organ that helps us to hear sound by converting pressure variation in air with audible frequencies into electric signals that travel to the brain through the auditory nerve. Various types of sounds of different frequencies are produced around us, but our ear cannot hear all these sounds. The sound that has a frequency less than 20 hertz cannot be heard by man. If the frequency of a sound is greater than 20,000 hertz, then we cannot hear that sound as well. The frequency range of hearing in humans is from 20 hertz to 20,000 hertz. The sound of frequencies lower than 20 hertz is called infrasonic sound and the sound of frequency more than 20,000 hertz is known as ultrasonic sound. Many animals use these two types of sounds in their daily life.